Built one of these great kits...... The only issue is the decals make the ship more gray than shades of blue. Otherwise it's a great kit.... Easy assembly, great fit, no flaws..... Just a bit small.... But I really am glad to finally have an accurate Defiant. Looks great, definitely may pick one up at some point. Looks great dude (agree about the grey, shame they did that because the prototype was lovely and blue), but still, can't wait to get mine! First use Tamiya white primer so the blue stays accurate.... I've learned if you use a grey primer it darkens the top color..... I used Tamiya AS-5..... Light Blue Luftwaffe.... 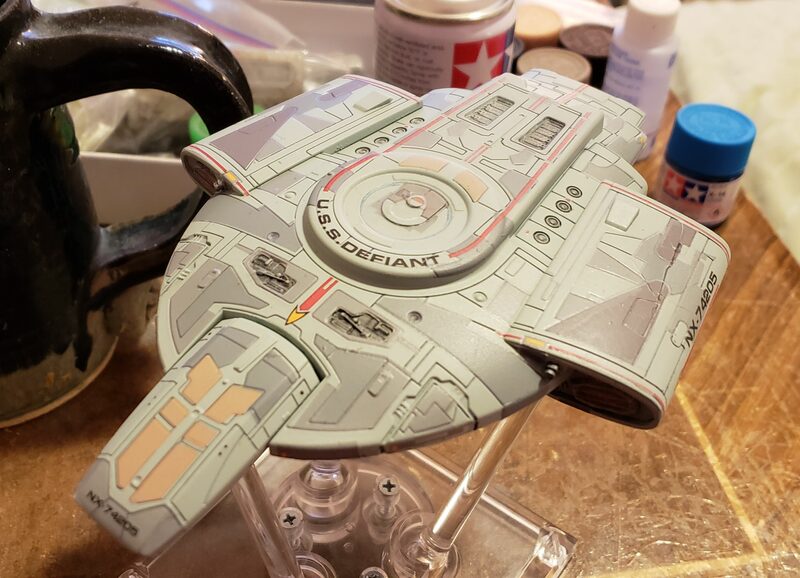 It's a great hull color.... Any other color would have made this much more gray. EDIT: Forgot to ask you, seeing as you're using that stand, did you put the bottom piece in? If so, could you snap a photo? In fact, if possible, just go ahead and take a dozen more! Jay K.... Another tip... I bought a Gundam marker (grey) and marked in all the panel lines on the hull..... You'll find it's too dark at first so you have to mist the model with the hull color very lightly to lessen the panel lines... This build was done fast because I wanted one to fly around lol.... There are some decal mess ups. I'm going to build another one. Great model! Thanks for posting all the snaps. Prometheus, thanks for doing that man (and thanks for the tips). I can't wait to get it! Beautiful build. I may need to get one of those. Hey JMW..... It's a great kit.... but only 7" long.... It's like a jumbo eaglemoss size. I would be willing to say, though, it's the most accurate model we have ever gotten of the mean little ship. Do yourself a favor and make sure you get one! How are the flight pose stands? I may need to pick a couple up for the smaller 3D printed ships I bought, and am hoping they would work. The 7" model should be fine, its the 4" one I worried about. Do you think it'd work with something smaller, kind of Eaglemoss sized? The flightpose stands are great..... They come in 6", 4" and 2"...... One of those sizes should work. I had to come back in and look at these pics. I'm currently trying to decide between this and the Grissom kit. It's a hard choice.